This week has been the hottest all summer. Walking is not practical during my lunch. No one wants to work with a sweaty, smelly secretary! As an alternative I walked and shopped through Western New York’s largest mall. The Walden Galleria – Air conditioned and entertaining. My father is a retired carpenter. I use the term retired very loosely as he just finished remodeling my kitchen. When I was a teenager my father helped to build the Walden Galleria. In fact, he helped to build many of the largest and well-known buildings in Buffalo. He told me of building the frame for the central curved stairway. His big brown eyes widened when telling me how the floor would crack in a few years because they didn’t put the tiles in correctly. The floor was replaced in many places! I still remember his thick Italian accent saying “Sonofapup – I told them!” My dad makes me proud. Remembering the conversations we had about the construction of this mammoth shopping mall, I walked along the second floor peering below at the planters, benches and shoppers. My eyes squinted as I looked up in marvel at the glass roof, easily hearing the take off of an airplane from the nearby airport over the din of the mall. I breathed deeply feeling my chest expand and quickened my pace. I had set my pace and planned to walk a mile in the mall. To be honest, it was distracting to walk in the mall. There were colorful windows advertising the newest styles and gift shops full of items waiting to be discovered and taken home. My feet were a little achy from pounding the concrete floor and I decided to treat myself to a pedicure. I need to take care of my feet since I plan to abuse them in four years, so I offered them a little pampering. This was only a temporary break in my stride as immediately after my pedicure I had to walk all the way back to entrance that I started from. My feet squeaked against my plastic sandals I wore. My pace slowed as I realized the lotion on my feet were causing my sandals to slide around my feet uncomfortably. All in all, this was one of my easier walks; very relaxed and not fast at all. It felt good to be among people and be a silent witness to their shopping day. I was very amused by children begging their parents for a video game, intrigued by a an argument that I couldn’t quite hear between a young lady and a young man, and a I felt little envious when I watched a group of women laughing, talking and sharing opinions as I walked by them. I have friends, but for some reason I do a lot of things by myself. Checking my pace (minus the 30 minute pedicure) I walked a little over a mile in the mall. There are mall walkers that walk the mall at 7 am everyday. Maybe over the winter months I will try it one or two days a week. For now, I think I will stick to walking in the outdoors. Where I can feel the sun’s rays on me, the wind making my hair a mess and my eyes can land on the beautiful colors of nature. One question I hear from my husband is “Are we walking or driving?” Today we are definitely walking. There is a car show in town and there are so many people that their cars are parked in front of our house and we are a quarter mile from town! Today was warm, very warm. Too hot to hold hands with my husband I lengthened my stride to keep up with his pace. We were excited to get into town and have lunch at our favorite place, Darrow’s. This portion of my walk was a bust as you can assume. Arriving at Darrow’s we found two stools at the bar and enjoyed the company of friends while I had a salad and my husband had a “Godfather” sandwich. My salad was a Pittsburgh salad. Not exactly for the health conscious, it comes covered in french fries. It was delicious as you can imagine. The “Godfather” sandwich is steak, jalapeno peppers and gooey cheese on a hard roll. He enjoyed it thoroughly. We both drank plenty of water before we headed out into the sun to see the car show. I knew this walk would be leisurely and relaxed. We walked through the triangle park and across the street to see my friend Pam and her family. We chatted and lingered. It was delightfully refreshing and my friend Pam is very happy and positive. Her energy is contagious! 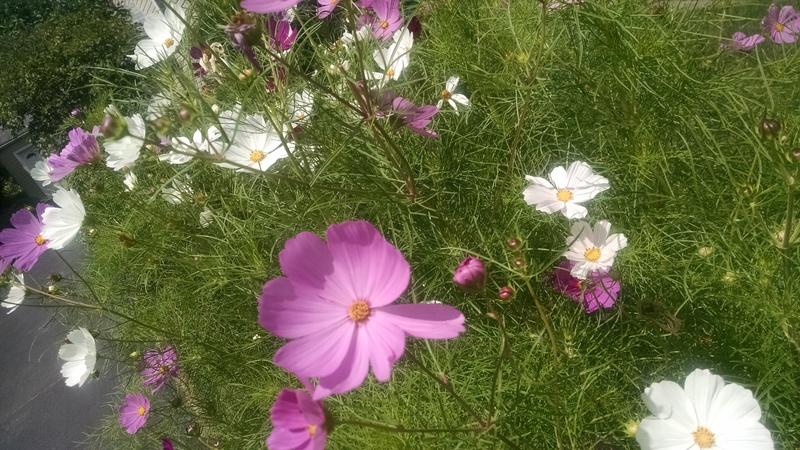 Regretfully parting ways, my husband and I walked back through the triangle park, stopped to listen to music and chat with friends and finally we walked up into the town park near the walking path. There were so many fun cars to see. Of course I didn’t take any pictures of them, though. My favorites were the ones with spider webs painted in purple and cars with flames. Someday I will own a car with flames. After walking the trail maybe I’ll splurge! Excitedly I saw an ice cream truck. I said to my husband….I hope they have Perry’s!!! Scanning their menu I found the Perry’s Strawberry Sundae Bar! It was only a $1 and soon it was just a memory of sweetness on my lips and stickiness on my fingers! Delicious!!! Walking down the walking path we heard a band starting and of course my husband loves any music! I told him I would continue my walk while he listened to the band and happily he agreed. Rounding the familiar path I zeroed in on the Joe Panza Trail. I couldn’t wait to be away from the loud music and hustle bustle of the car show. Easing onto the trail felt like returning home after being away for too long. I embraced the cooler, shaded air with a deep cleansing breath. The loud music was too much for the little path and it gripped my ears. In fact the music was horrible! The vocalist was very bad and I knew Dave wouldn’t want to stay to listen to that for long. Quickening my pace I hurried to make a short walk meaningful. the tall trees leaning over the path letting in the sun in with peek-a-boos as the wind blew the leaves. Turning around (yes, sometimes it has to be) I followed a blue morpho butterfly out of the trail. It made turning around easier when you had such a beautiful leader. The little fellow would not land for me to take a picture and I watched as it floated up into the trees and was gone. Here is a stock photo. With a tinge of regret that the music was getting worse and much louder as I neared the trail head my stomach flipped flopped with love as I could see my husband watching for me. 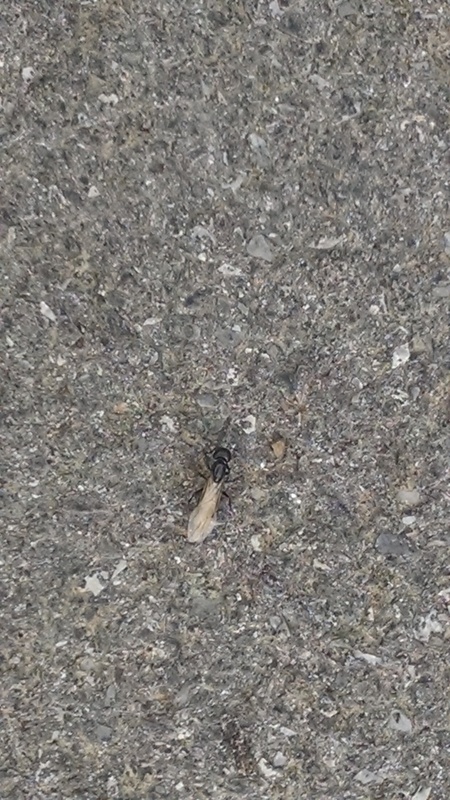 I stepped onto the walking path and discovered that had I interrupted the walk of a large winged ant. Something compelled me to take a picture and when I bent down, the little guy stopped for a moment and posed for me! Thoroughly amused I jogged to catch up with my husband and we continued our journey. We saw the Mercy Flight helicopter on display and we decided to take a closer look. It was much smaller on the inside than I had imagined and I said a quick, silent prayer for the crew and passengers, past and future. Feeling Dave’s tiredness, I quickened my pace and we headed home. Holding hands now, we chatted about our day and talked about our gratitude for living in such a great little town. I had set my app to measure my pace and all in all we walked about 3 miles. A very lazy walk of 3 miles. As we entered the house, we could hear the strong thuds of Mercy Flight’s blades hit the air in take off, flying low. Thankful that it was only for show. Author trailchaser2020Posted on July 26, 2015 July 30, 2015 Categories UncategorizedLeave a comment on Sunday afternoon. No time. Failure is not an option. Friday. July 24. I did not feel like walking! It was a beautiful day. The sun was shining and I just didn’t want to walk. I skipped my walk during lunch today. It made me feel bad and little like a failure. I’m always so afraid of failing. I have a feeling the title of my post will be a recurring one. So many times I feel like I run of out of time to actually do the things that are important to me as a person. I know, cleaning, laundry, cooking are important…but I want to WALK and get ready for this adventure! When I arrived home, my 23 year old son, Carl, was coming over for dinner, my husband, Dave, was waking up from a nap and I was irritable! There wasn’t anything I could do about it. We all went out to Bubba-loos for cheeseburgers and ice cream. It was so much fun and I soon forgot all about being moody! We decided to let Carl drive my car to dinner and his foot was skittish with mom and dad in the car! I had to tell him “let’s go!” We had ordered and had our burgers sitting outside on a pink picnic table. We enjoyed watching children playing in the large grassy field behind the building. It was a special time to share and I am grateful that we were together. After finishing our burgers we ordered ice cream. 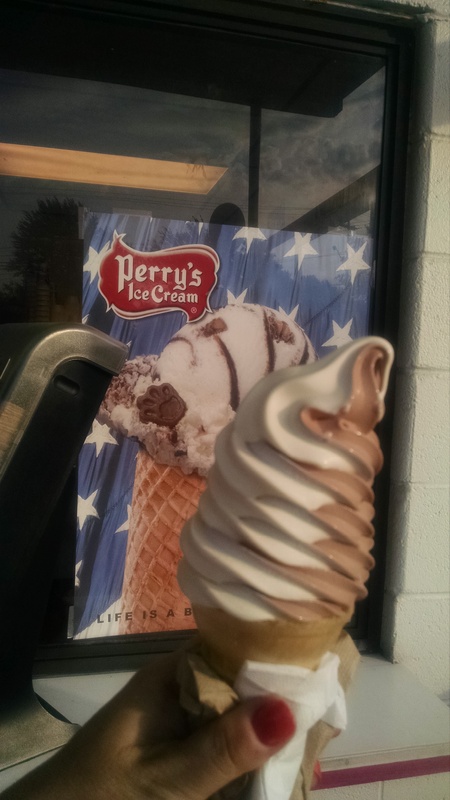 My husband works for Perry’s Ice Cream so it isn’t exactly a new treat for us. I ordered a custard twist. It was delicious. In the back of my mind was my walk…will I have time tonight? Arriving home, Carl left to be with his girlfriend, Amanda and Dave and I got ready to visit my sister. My sister, Anne, lives down the street from me. I knew we should WALK! It would be dark by the time we left my sister’s, but it is a quiet street, so we would be safe. It isn’t far, in fact I didn’t even track it to my sister’s house. I just was glad my husband agreed we could walk there. The walk there was quick and easy. The walk back at 10 pm was so beautiful. We looked up at the stars twinkling at us and got ready to jump the curb when a truck was headed at us a little to fast! We made it home safe and sound and I was so glad that even though it wasn’t quite a mile there and back, I still was able to walk today! Author trailchaser2020Posted on July 25, 2015 July 25, 2015 Categories UncategorizedLeave a comment on No time. Failure is not an option. Thursday. July 23, 2015. Happy birthday to my husband! Staring out the window at work I contemplated my walking adventure for the day. The sun was shining, but there was a large black cloud. Rain was not in the forecast for today, what the heck? I packed up my protein shake and cheese sticks and headed out the door…just in time for large rain drops plop on my head. Great. I headed back in and grabbed an umbrella. I wasn’t going to let rain drops stop me. I set my pace and walked briskly out of the courtyard to the street. My umbrella was pink with “Love is all you need” written all over it. It cheered me up as I made my way to the dreaded intersection. The raindrops were far and few between, so I lowered my umbrella at the intersection and hung it on my wrist. I twisted the blue cap off my protein shake and took a large swallow. The white pedestrian man blinked for me to safely cross and I quickly made my way across the street. Approaching me was a large group of pre-schoolers with their caregivers, apparently on a little field trip. The children were so happy and smiling. Everyone of these children had Down Syndrome or other handicap and their joy at life encouraged me as I smiled at them. Most of the children said hello to me and I returned it with a cheerful hello and smile. What little precious beings! I wished I could walk with them! 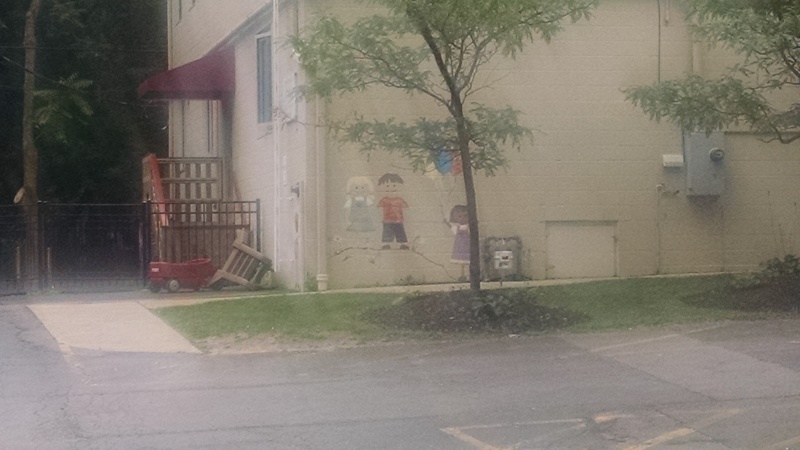 This must of been the pre-school the children were walking from. Breathing deeply, I turned onto the street Chateau Terrace. It sounded fancy and exclusive! 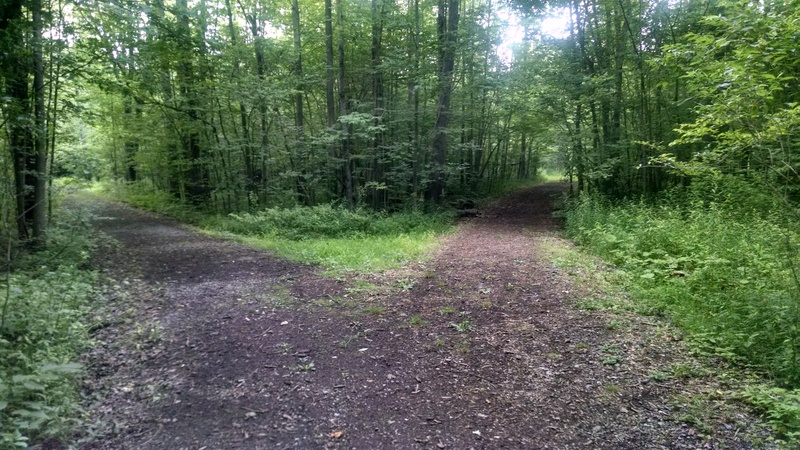 I knew it was a dead end, but found it had many outlets that wound back to my start. Perfect! The street was much like the one I walked down yesterday, with many cute houses and tidy gardens. All of my pictures are blurry for some reason. This was a big house with colorful Adirondack chairs. Today I had my black, flowered back pack on, weighed down with about 5 pounds. Wearing my floral skirt, walking shoes and back pack, I must of looked like a missionary or door to door sales person! No one bothered me though, so it was good! The rest of walk was very enjoyable as I passed tiny cottage house and big, new remodeled houses. It was so quiet, I could hear the birds singing and planes passing overhead. I remembered to check my pace; I was at .59 miles. Rounding the corner headed back to the brick office building I thought for sure I would hit my goal of 1 mile. Nearing the entrance to the courtyard back to my office I checked my pace again. I was short! I need .10 to make 1 mile. I headed to back of the building, walked like a crazy person around the parking lot, waiting for my app to tell me I hit the 1 mile mark. Finally, I heard the electronic voice say, 1 mile at a pace of 21 minutes 47 seconds. Now, I could head into work. I made sure to walk a little on the lush, green grass next to my building and then hurried up the stairs into my office. I’m leaving one pair of walking shoes at the office, so I never have to walk in high heels again! Author trailchaser2020Posted on July 23, 2015 August 13, 2015 Categories UncategorizedLeave a comment on Walking in the rain. Another day, another chance to keep walking. Wednesday, July 22, 2015. At work today the glorious sun beaming through the window panes lured me outside to eat lunch. Today was the day “I start” walking during my lunch time. Entering the concrete and brick picnic area outside my office I hatched my plan. After gobbling down a healthy cold slice of pizza and washing it down with a protein shake I would walk 1 mile. Grabbing my lunch bag, weighed down with a bottle of water and my latest reading material, I set out. With the pizza churning into a nice dough ball in my stomach I walked briskly toward Main Street out of the courtyard of the brick office building where I worked. The smell of freshly spread blacktop sealer seared my nose. I patiently waited at the busy corner of Main St. and Harlem Road for the light to change to begin my latest adventure. Walking across this intersection every day is taking my life into my own hands as cars whiz by without regard to pedestrian right of way. Making it safely across I wished I had remembered to bring my walking shoes to work. Walking in high-heeled sandals was a challenge, but I looked good. I think. I walked past a florist, three restaurants, a gas station and a drug store then found a quiet dead end street that I immediately knew was today’s walking path. The street was residential with craftsman homes that all had neat, tidy yards. I could hear birds singing and spied children coloring with chalk on the sidewalk across the street. This neighborhood was idyllic and charming. Unfortunately, I suddenly realized in my eagerness to “start” I neglected to start my phone app that keeps my pace. Not losing stride I quickly started it up and chugged along. My left foot had a funny twang that I disregarded to the fact that high-heeled sandals are not walking shoes. As I came to the dead end of the street I realized I had to turn around. Yuck. I don’t want to ever turnaround, so I walked up the other side of the street, reasoning that this was a new path since it was on the opposite side of the street. Slowing my pace I enjoyed the gardens of the houses I passed. 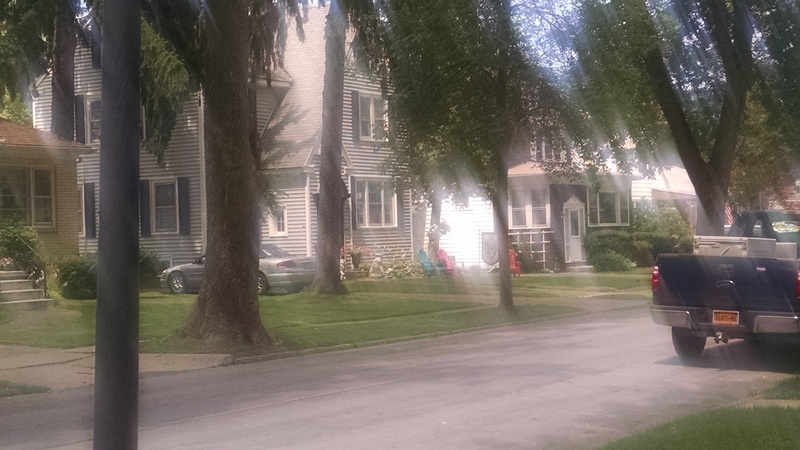 There was a house with two Adirondack chairs in the front yard, just calling out to weary travelers. I wasn’t weary, so I carried on. Main Street was ahead and along with it, loud bangs from a garbage truck, cars honking and weaving around the street. My feet hit the concrete sidewalk hard and I wondered if any of the Appalachian Trail was on a sidewalk. I hope not much, if any. Carefully making my way back to work, I resisted the urge to stop at TWO ice cream shops and a chocolate shop. Walking on the concrete and black top is not my ideal conditions and I knew what I had to. 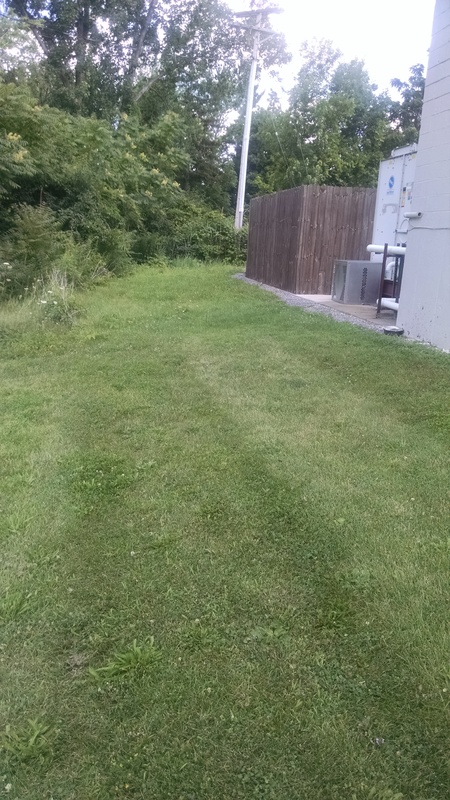 Approaching my office building I walked around to the side and found a lush green patch of grass. Not much, but it was enough. I was tempted to pull my sandals off, but a bee lurking at a wild strawberry flower stopped me. I felt the tickle of the grass on my ankles and toes and breathed in a deep, cleansing breath. I checked my pace, figuring in my “lost” portion with the map. My pace was 1.1 miles and I was so glad “I Started” walking during lunch today. 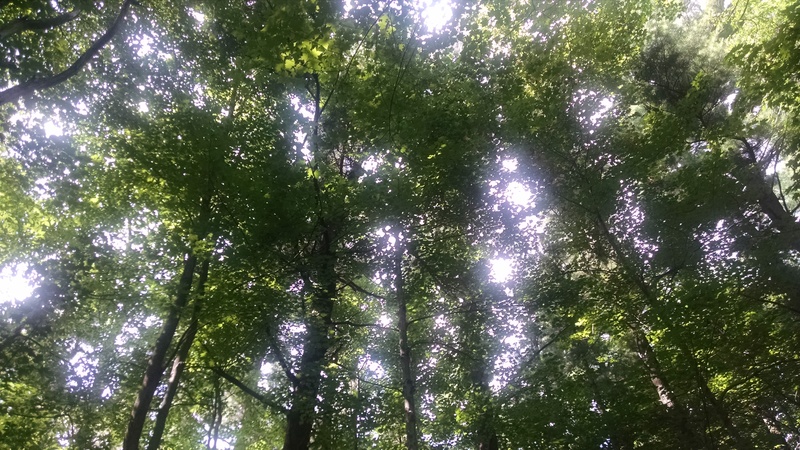 Author trailchaser2020Posted on July 22, 2015 July 22, 2015 Categories appalachian trail, exercise, hiking, nature, walkingLeave a comment on Another day, another chance to keep walking.